Don’t kill the wide receivers. 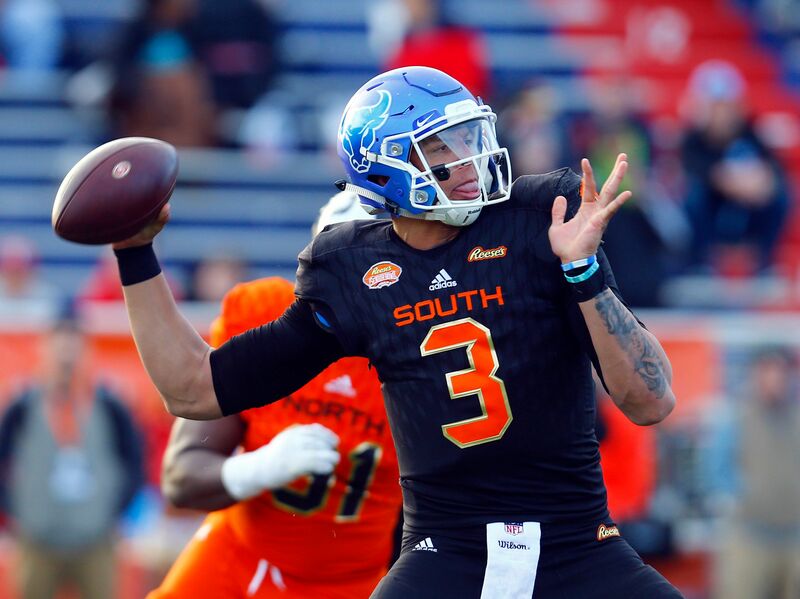 It’s not the most conventional lesson to be learned at the NFL scouting combine, but it will surely be part of the buzzy narrative that follows Buffalo quarterback Tyree Jackson wherever he’s drafted in a few months. Just part of a building mythology, from his size (6-foot-7 and 249 pounds) to the jaw-dropping 40-yard dash (4.59 seconds) and the 34.5-inch vertical that will likely make him the most athletic quarterback in this draft not named Kyler Murray. Unlike the Oklahoma Heisman Trophy winner, Jackson decided to throw at the combine – leading to one of the more eyebrow-raising moments in the drills. Specifically, when he continually unleashed short-area fireballs in the “gauntlet”, which is meant to test the ability of receivers to catch and react while running a line and simultaneously catching balls from multiple quarterbacks. Jackson’s problem? He appeared to be slightly overzealous with his throws. That was only the beginning. Within minutes, the broadcast was focused almost entirely on Jackson throwing lasers in the drill, with former Dallas Cowboy wideout Michael Irvin breaking down in laughter and former Carolina Panthers and Baltimore Ravens star receiver Steve Smith actually making his way over to the Buffalo quarterback to give him a piece of his mind. Smith’s message? Stop trying to take the heads off receivers. Eventually cameras cut to Smith lecturing Jackson on the field before the drill had even ended – all while Irvin and the booth laughed hysterically. “Man, we over here trying to make millions of dollars, he over there b.s.-ing, throwing the ball so damn hard,” Smith said. If Jackson ever makes good on his touted skills, Smith’s combine intervention will end up being the stuff of legend. In a way, it already is. 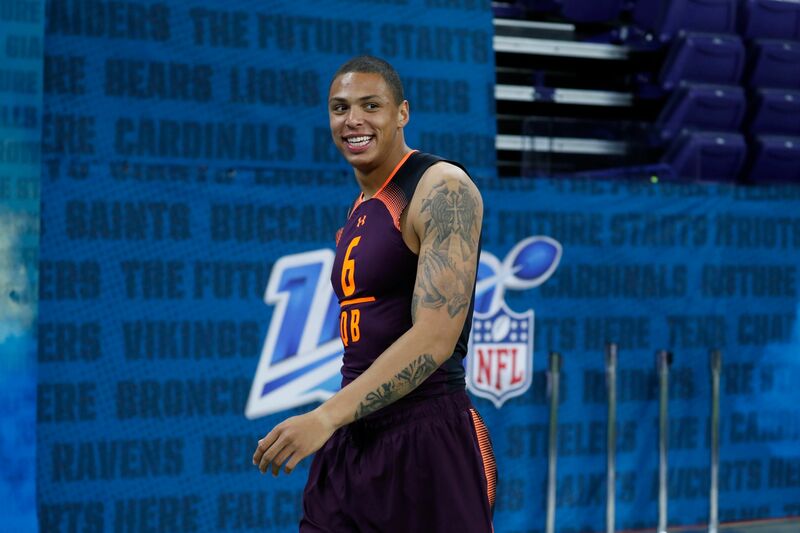 In a fairly average quarterback class and with Murray sitting out of drills, Jackson has devoured the social media impressions during the combine – which isn’t unusual in a process that is always looking for the dark-horse quarterback who becomes a massive middle-round score. Undoubtedly, the intrigue and curiosity will already help wherever Jackson lands next, helping to further the opinion of some that he’s one of the more interesting physical prospects (if not the most interesting) at the quarterback spot. In a way, he’s the opposite end of the spectrum of the 5-foot-10 Murray, confronted with some similar questions about how often a player of his size actually succeeds in the NFL at the quarterback position. And that’s where it gets more interesting when it comes to Jackson. If you’re willing to listen to the more critical thoughts of evaluators, the scouting assessment has been less flowery and electric than those of the media or an array of professional draft analysts. While Jackson has been painted as the big quarterback with the big arm, some NFL personnel evaluators who spoke to Yahoo Sports were far more critical, painting Jackson as a hyped-up prospect who is exponentially more raw than the recent NFL quarterback draft pick with whom he’s most often compared – the Buffalo Bills’ Josh Allen. At first glance, the comparison to Allen would seem to fit: two massively sized small school quarterbacks, both with some notable athleticism for their size and each reputed to have a big arm and accuracy issues. But a handful of NFL evaluators threw that comparison into a virtual ice bath over the weekend, essentially suggesting it was a “lazy eyeballs” assessment. Following a set of throwing drills on Saturday in which Jackson appeared to have held his own with the first-round quarterbacks, several evaluators actually took aim at Jackson’s arm and suggested it’s not as big as people make it out to be. “His arm strength is fine, but I think a lot of people equate ‘big’ to strong arm, when [Jackson’s] is more in the league average range,” one evaluator said. Senior Bowl director Jim Nagy – whose game hosted Jackson in January – equated Jackson’s arm to having “starter-level” NFL talent. That alone will get him on the board of every team in the league, but it’s also a far cry from being anything generational. The overall assessment? Last year, Allen was seen as a guy who was raw, but Jackson is being painted as an exponentially bigger project. Which is saying something, considering Allen was often pilloried as being a prospect who would take several years to develop. That doesn’t mean Jackson won’t get plenty of buzz, of course. The lower he goes, the easier it will be to generate the excitement of a raw-skill quarterback with intriguing potential and a ceiling that could be high, depending on his level of coaching in college. And you can guarantee that latter aspect will be a big selling point for some teams, as it’s not unusual for quarterbacks to get much better coaching in the NFL when they are getting plucked out of smaller schools with more limited resources. One thing is for certain: Jackson is exactly the type of quarterback who generates some excitement when he gets drafted in the middle rounds. He’s big, extremely fast for his size, looks strong and has an arm live enough to put some pressure on the guys in front of him. In a league continually scrounging for quarterback talent, that’s the kind of thing that not only gets a player drafted – it occasionally gets an NFL team to take a swing a little earlier in the draft than anyone expected. Time will tell if that happens with Jackson. But his buzz, whether it’s mythology or reality, is already undeniable. And that will likely only grow in the coming months, regardless of how many wide receivers he attempts to decapitate on national television.